I know that for many people there is nothing duller than a diet blog. If you feel that way, I recommend you just skip this post, and I promise I won’t talk about it again for a long time. But if you want to know how I lost 20 pounds in a few weeks with almost no effort, read on. You can distribute your 500 calories throughout the day however you want, and you can choose any type of food you fancy so long as it adds up to 500. What does 500 calories look like? After experimenting for a couple of weeks, I settled into a set menu that works for me. I’m never hungry first thing in the morning, but when I do want something to eat around 9 or 10 am I have a piece of fruit. Then I have another piece of fruit for lunch around 1 pm. If I get hungry in the afternoon I drink herbal tea, and that gets me through until I go home. 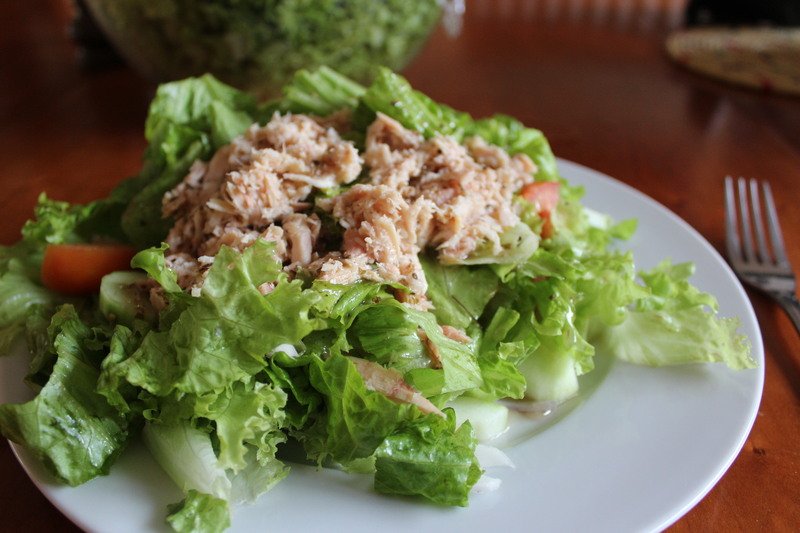 I have dinner at about 6 pm: a big green salad with a can of tuna and 2-3 tablespoons of vinaigrette dressing. Then more herb tea until bedtime. This diet works for the simple reason that you eat fewer calories over the course of the week than you used to. People wonder if then you are so hungry the next day that you overeat. For me, the answer is no. I find that I appreciate food more on my non-fasting days, and I think I actually make better choices as a result. I suppose if you started pigging out on your unrestricted days, you could add a third fasting day. I’m sure the diet would work even better if I added some exercise into the mix. Maybe I’ll do that later. But it’s working for me now because my 5 normal days are just that: normal, with no foods to avoid, and no calories or points to think about. And the 2 fasting days are really quite refreshing (I’m not just saying that). I really look forward to this on Monday and Thursday evenings. Observant Orthodox Ethiopians fast two days a week all year long, every Wednesday and every Friday. “Fasting” has a different meaning here: it’s basically a vegan menu, with no animal products (strangely, though, it seems tuna is acceptable under the fasting rules.) But I do feel a little more in tune with the culture when someone offers me something I can’t have on one of my two days, and I say “no thanks, I’m fasting” … and that’s perfectly ordinary. This entry was posted in Food and tagged 5:2 fasting diet, diet, fasting. Bookmark the permalink.